Then in the 1980’s, the breed gained popularity after debuting in a few movies and films. Today the American Pit Bull is quite different from its ancestors, due to their calm and loving nature. 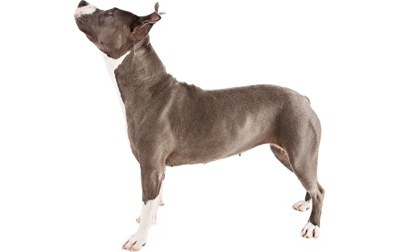 Staffordshire terriers are also closely related and resemble the American Pit Bull Terrier we have today. Their muscular built and wide head are their most defining physical features. The Pit Bull has a bad reputation for being an aggressive breed. Surprising to most, these dogs are actually very loving. These obedient canines are loyal and trustworthy, however, they are also known to have a goofy side as well. They are fast learners and well-behaved when trained early, and can be a great addition to any household. It is important to keep in mind that they can also be quite stubborn at times. Their strong-willed attitude comes out when they are being forced to do something that they have no interest in doing. It is important to keep in mind that they can also be quite stubborn at times. Their strong-willed attitude comes out when they are being forced to do something that they have no interest in doing. When it comes time to train an American Pit Bull, socializing them at a young age is very important. For the best chance of success, training should begin while they are still a puppy. Their obedience training should be composed of mental stimulation, human interaction, and physical activity. This working breed excels when mentally challenged, and can learn basic commands quite easily. The American Pit Bull Terrier requires a moderate level of physical activity. Due to their high intelligence, this breed needs to be mentally stimulated as often as possible. Several walks throughout the day are highly recommended to keep them from getting bored and possibly destructive. This breed makes for a great walking, running, or hiking companion. The American Pit Bull Terrier is known to have a lifespan anywhere from 12-14 years. This is surprisingly higher than most breeds that are medium sized. Are Pit Bulls a Popular Breed? Once viewed as the all-American dog, the Pit Bull has been a fan favorite for decades. According to the AKC, the American Pit Bull Terrier is ranked 81st most popular breed in the U.S. today. Many pet owners are drawn to this breed because of their affectionate and loving personalities. It is recommended to feed a Pit Bull smaller portions several times throughout the day. Their diet should be determined by their age and activity level. Most medium sized dogs consume around 20 pounds of food per month. Consult with your veterinarian for a catered food regimen specific to your canine. Also, keep in mind to always have fresh water available at all times. The American Pit Bull has little grooming needs. Use a short bristle brush to make the coat shiny and soft. Regular brushing will also help keep shedding to a minimum. All in all, this dog has is very low maintenance when it comes to their grooming. Make sure to also trim their nails to prevent breakage or infection. Are Pit Bulls Good With Children? The Pit Bull has an energetic attitude that pairs great with children. They’re playful by nature, making them approachable to any human. When provided a loving home, they pretend they are just another member of the family. Dysplasia: Pit bulls have one of the highest rates (25%) of hip dysplasia compared to any other breed. Elbow dysplasia is also reported at a very high rate at 18%. Dysplasia occurs when there is a deformation in either the hip or elbow. This can cause limb lameness, pain, or immobility. Hypothyroidism: Pit bulls have a much higher than average rate of hypothyroidism due to autoimmune thyroiditis. Bloat: Pit bulls have a high incidence of bloat or gastric dilatation volvulus, a potentially fatal emergency in which the stomach twists and traps gasses. This can lead to permanent damage or even death not taken care of right away. Degenerative myelopathy: This bone disease affects a much larger percentage of APBTs compared to other breeds. This condition causes progressive weakness beginning in the hindquarters and gradually moving forward until the dog cannot move. It is the canine equivalent of Lou Gehrig’s disease and is inherited recessively. Myotonia: This muscular issue occurs when there is a constant contraction in the muscle fibers. This hereditary condition can also cause a delay in relaxation and can be very painful for the animal. Cerebellar ataxia: This neurologic condition produces a drunken-type gait. Cerebellar ataxia causes poor coordination and tendency to stumble. Urate bladder stones: Although uncommon, bladder stones have been seen at higher rates for the American pit bull terrier. Distichiasis: This health problem occurs when eyelashes are abnormally positioned and irritate the cornea. Skin problems: Mange and skill allergies are both commonly seen in this breed due to their short-lengthed coat. Many of these issues can be fixed with help from a veterinarian. American pit bull Terriers have a slightly increased risk compared to other breeds for deafness, persistent pupillary membrane, congenital heart disease (pulmonic stenosis and subvalvular aortic stenosis), cruciate ligament rupture, stomach cancer and a skin disease called actinic keratosis. Progressive retinal atrophy has also been reported. After 30 days on May 16, 2016, I tried the capsules twice a day. That was the last time he had a seizure. He has been free ever since. I can’t thank you enough. I also recommend it to others I meet with similar problems. CBD was recommended to me last year and, after doing some research online, I decided to try treats from Canna-Pet. I am so glad I did! He is so much more comfortable than he was just a few months ago. I just wanted to let you guys know what a benefit the Canna-Pet Organic Biscuits have been for my dog George. He is definitely more relaxed, not whining or nervous all the time like he used to be. He is a much happier, more playful dog. Thank you so much! We give her a morning capsule and drops later in the day. She enjoys her evening walks much more and hurries up the back stairs again. She also sleeps more comfortably!